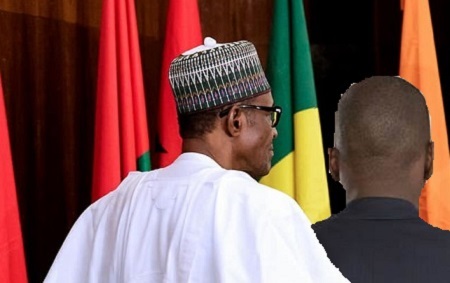 Junaid Mohammed, a Second Republic lawmaker has alleged that some relatives of President Muhammadu Buhari are pressurizing him to reinstate the sacked Director-General of the Department of State Services, DSS, Lawal Daura. Recall that Vice President Yemi Osinbajo recently sacked Daura over DSS invasion of the National Assembly. However, Mohammed claimed that Buhari’s kinsmen want Daura reinstated while the National Security Adviser, Mungono should be fired. Speaking with Punch, the former lawmaker said the intrigues surrounding the sack and alleged move to reinstate Daura was an indication of how incompetent the Presidency is. He said, “What happened was very unfortunate and whichever side you want to blame or give credit to, it has really reduced our country, our democracy to that of a banana republic and the fact that since the event happened, there has been no statement-except the one which came from the office of the Acting President, denying any involvement in what happened. “Now, this Lawan Daura has been arrested and all the noise about searches being conducted in his house or houses either in Abuja or other places. What happened or did not happen to him is a story for another day. As far as I am concerned, the event itself has been a great disservice to this country and as I said, it has reduced us to the place of a banana republic which is very, very unfortunate. “This democracy has cost us so much in terms of money, in terms of labour, in terms of political argumentation for it to be seen to be threatened this way by a gangster and a few of his servicemen holding huge Israeli guns, it is really unfortunate and it speaks volumes about the kind of government we are running and the kind of leadership we have. “Since the event happened and the dismissal and arrest of Lawan Daura there has been no statement from Buhari himself, only guesswork. There is also the spin that what (Yemi) Osinbajo did; he did it with the knowledge and blessings of Buhari. “There is an ethnic attempt by those who are related to Buhari, who are from Daura, who must be related to Lawan Daura, who now want to travel to the United Kingdom to ask Buhari to reverse himself and virtually bring back Lawan Daura and then sack the National Security Adviser who was supposed to be Lawan Daura’s boss but who he never respected and who he was not even in speaking terms with. “You can see that the whole thing now is becoming a typical Nigerian football game where everybody kicks it the way he likes. It is very unfortunate and it is more or less heading towards a climax of the kind of Presidency we chose for ourselves in 2015 and the kind of situation Nigeria now finds itself. “It speaks volumes about the incompetence and the irresponsibility of this Presidency, the ruling party and the main opposition party and all seems to be a bloody mess. If you recall, like I told you before the elections and thereafter, that there is no difference between the ruling All Progressives Congress and the opposition, Peoples Democratic Party, which are in fact two sides of the same coin.